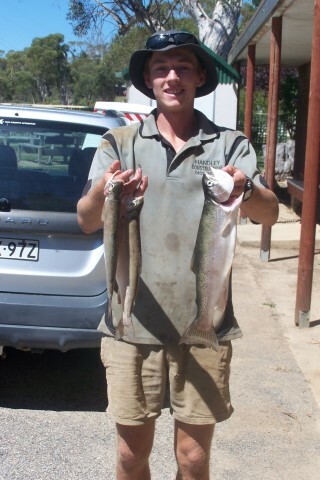 Lake Eucumbene is still dropping at a fast rate but with the recent rain and cold weather things are looking better. Most fly fishing has been ok with wet flies but pick your areas around the lake try fishing around rocky areas and look for good gully’s where the wash has been going in. Over at Middling bank on the eastern side has been good and over at frying pan most fish have been holding up in these areas after the recent rains, Best wet flies are woolly Buggers, Nymphs, woolly Worms, Craig nighttimes, with a slow retrieve. Best times have been between p.m. and 11pm at night overall the fishing has been a little hard but fish at the right time thing will get better. On the river the fishing has been ok up at Sawyers and Kiandra with some good rainbows taking nymphs in the runs, With the dry’s Klink hammers, Stimulators, Adams these have been the pick late in the afternoons. fishing at Jindy is again up and down like Eucumbene so most of the fishing is better around p.m. till late over on the western side the fishing is picking up with some good browns coming close to the shore line after dark woolly buggers are the pic at that time. Over on the Eastern side around Jindy East fishing with woolly buggers and Mrs Simpsons have been good alone with Black Nymphs, up at Kalkite fishing is still going well with some fish coming in close in the middle of the day so walk the banks and have a good look you should see some good browns. 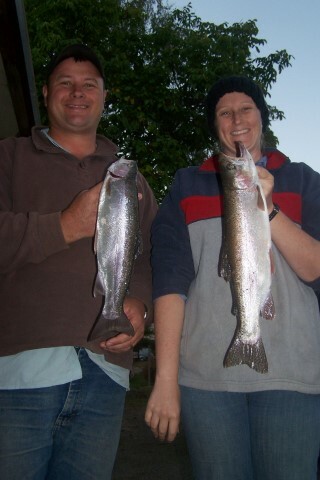 Overall the fishing has been ok like Eucumbene so fish at the right times you should get results!! Trolling Eucumbene has been up and down on the lake but after last nights rain thing are looking good yes the lake is dropping and the fish are going deeper so move out into the deeper waters and slow down most trollers have been doing a lot better. Most Tassie have been working well along with the Rapala’s , Minnows , Blades and crick hoppers behind cow bells and ford fenders, Best times are around 6am till 10am and late in the afternoons remember stay away from the banks go out into the deeper waters. Best areas are Braemer bay start heading down the lake if you're fishing Buckenderra get out into the deeper water. 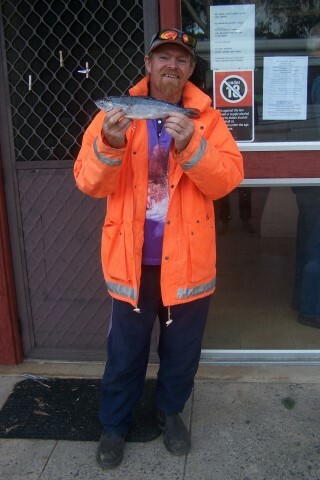 Here are some pics of some of the fish caught trolling Eucumbene in the past few days. The biggest was a 5.5lb rainbow. Well jindy has Improved a little with some good reports coming from the dam wall and east Jindabyne up around Kalkite the trolling has been good late in the afternoons. 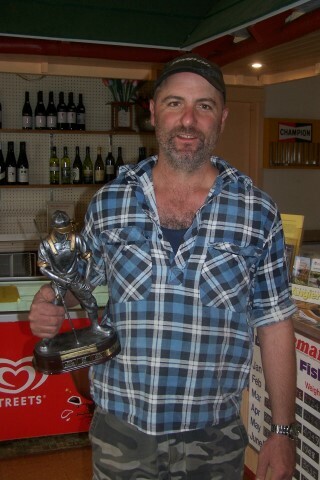 Like Eucumbene move out into the deeper waters slow down, Best lures are Stings, Blades, Rapala’s and larger Celtas. Overall Jindabyne is fishing well just get out there at the right time things will Improve unlike Eucumbene the lake is high and the water temp is good overall jindy is the place to fish at the moment. 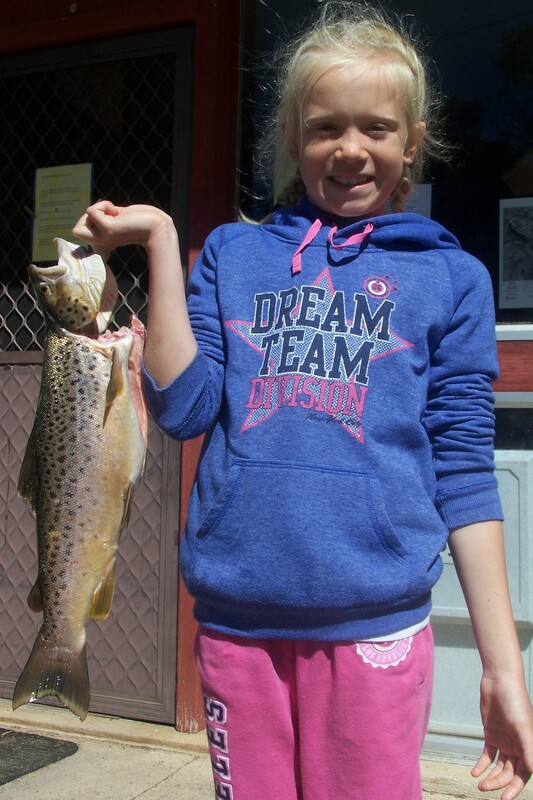 Me and my dad Jim fished lake Jindabyne over the Easter week we caught 17 brown trout to 2.5kg , we caught all the fish on downriggers set at 14 meters in 16 meters of water . Peter at Braemar here with an updated fishing report leading into and including the Easter break. The Lake level continues to drop dramatically which now sits just below 42%, some 17% having disappeared over the past 10 weeks, that must be some sort of record, lets hope there is some left for those who will need it for irrigation purposes when the time comes, very puzzling indeed !!!!!!! Of course all the indicators and results leading up to Easter suggested a disaster was unfolding, the fishing had been absolutely atrocious with Braemar not having one fish recorded for 9 days in spite of several anglers doing their dandiest to catch an elusive trout, the very warm and dry conditions were obviously a factor with water temperature on the surface being a warm 20.3c, hardly what you call Alpine conditions. The Gods must have been listening and 2 days before the Easter crowds arrived at Braemar the fish started moving, not in big numbers but enough to get anglers enthusiastic and motivated, the Internal Braemar Bay Anglers competition got under way with some nice results, the mix being 69 rainbows up to 990 gms and and 4 Browns up to 1197 gms, most anglers enjoyed some success and it was particulary pleasing for all to see that the fish had returned just in time. Most results came from trolling, the ever reliable # 28 Disco Dancer proving to be very popular as with the Sunset Frog # 94, # 106 Tribal and # 36 Yellow Wings being the only lighter colour to tempt the fish, Fly-fishing again saw mixed results with Olive Woolly buggers and small nymphs doing well during daylight hours and practically nothing doing any good after dark, the bait fishers did OK with Chunky Cheese, Mudeyes and live yabby’s and the lure casters did well with Pegrons and flashy bladed lures, in all it was a pretty good few days at Braemar. Since Easter the fishing has continued to improve with very good quality Rainbows now out and about, Chunky Cheese and Power baits have continued to bring results and mudeyes are still having an impact, but the big news is that the Browns are now coming back and just this morning, Thursday March 31st an absolute Monster was lost just in front of the Park by former Australian Casting Champion Vinnie Ford who has been fishing at Braemar for over 50 years. According to Vinnie this was a seriously big fish, it was tempted by his own tie of a “Yetti” retrieved slowly, the fish was in about 1 meter of water, so close to the bank and was on for 22 exciting minutes on a 4 lb. tippet, so as you can imagine it was quite the challenge, Vinnie covered a lot of ground trying to turn the fish and at one stage he estimates some 70 meters of line and backing were between him and the fish on 2 occasions, like most big and smart fish it found a way to discharge the fly and left Vinnie with only the memory of such an exciting encounter, obviously trying to estimate the size of such a fish is impossible but according to Vinnie who witnessed a 8kg fish being caught here in the 70’s, in his opinion this fish was well over that weight. Braemar Bay Holiday Park is private property, access to the Lake is for onsite and paying guests only, we do encourage visitors and have no problem with them accessing the Lake through the Park as long as they obey our rules, no camping along the foreshore whatsoever at anytime and please take your rubbish with you and of course come to the shop before you enter the Park, buy a drink or ice cream and have a chat about the latest results, do not enter the Park without permission thanks. Pictured below are Steve Smith, Jessie Maugher, Archie and Beccy Hallam, Jordan Isedale along with McKenzie Isedale and her competition winning Brown of 1197 gms and Glen O’Hara with the Prestigious “wish I could catch a fish trophy” , thanks to all who made the Easter event a success and for their efforts throughout the year, especially Harold Lauer and Ted Turk and their committee along with the Rocky Plain Rural Fire Brigade who provided such and interesting and appreciated session at the BBQ.